This is a guest post by Arajal about a more in-depth look at Symbiosis. The WoW blogosphere has been abuzz with talk about druids’ new spell, Symbiosis. Needless to say, it’s something that has many druids excited. I’m no exception to this; as both a resto druid and a healing coordinator, I’m especially interested in Symbiosis’ possibilities. I figured I’d throw up another guest post that looks at the practicality of each synergy a resto druid has available to them through this spell. Note: We’re still in early beta, and these spells are more than likely to change. I’ll re-evaluate new combinations as they come up, but for the time being, this is what I have to work with. Linking Symbiosis with our disease-wielding undead friends will yield Icebound Fortitude for a resto druid. This is a link I could see having strong benefits in both PvE and PvP, moreso for the latter. In PvE, I wouldn’t be surprised to see bosses equipped with a random single-target or group stun ability, in which case using Icebound Fortitude would open a window for healing that otherwise wouldn’t exist. Plus, the 20% damage reduction is like a second Ironbark (albeit on a slightly longer cooldown and only self-cast like Barkskin). In PvP, this link’s benefit shines far more brightly. Having a cooldown to make yourself immune to stuns and drop incoming damage by 20% would help immensely while being focused, something resto druids are likely to be the victims of. Even while not being focused, being immune to stuns during clutch healing situations can be the difference between a win and a loss. As for what our death knight friends get out of the link, Wild Mushroom: Plague is a very nice ability for spreading diseases without expending runes, freeing them up for more DPS abilities. Looking over at Blood’s spell, they get a very nice health cooldown through Might of Ursoc that not only increases total health by 15% (similar to Vampiric Blood), but also brings their health up to 15% should they need it. Linking with a hunter gives a resto druid Deterrence. As far as I’m concerned, this is one of the better Symbiosis links if you’re concerned with both self-preservation and mobility. While it won’t clear any debuffs you have, it will prevent any incoming damage and suppress any damage you are taking by 30%, giving other healers some breathing room to help you out. Unfortunately, it currently does prevent you from casting any heals of your own, but being able to gain temporary immunity to damage while still retaining the ability to move is worth the trade off in my eyes. Deterrence in PvP will definitely be a boon to any healing druid should they find themself there. Being able to “deter” (see what I did there?) any DPS trying to focus you down can have a huge impact on the tide of battle. Even if it’s only for a few seconds, it will still give you some breathing time to figure out your next move. Heck, you could just use it for a few seconds to keep the pressure off, then cancel the buff and go back to healing. Hunters get Dash out of the deal, and while they already have spells like Disengage and Aspect of the Cheetah or Aspect of the Pack, it still gives them one more tool to get from point A to point B in critical situations. I know the hunter in my normal raid group would love a new way to get around the field quickly. If total self-preservation is your cup of tea, link with a mage. A resto druid gets Ice Block from using Symbiosis on a mage, and aside from Divine Shield (which our fellow kitties get from linking with a paladin), Ice Block is the best way to survive in clutch situations. The number of times an Ice Block could have saved our raid or at least helped in wipe recovery are innumerable. Much like Deterrence from hunters, Ice Block is a very useful spell to use when healing is at a premium in PvE or you’re getting focused in PvP. The benefit of taking Ice Block over Deterrence is the removal of all debuffs and total immunity to all harmful effects, but at the cost of mobility. While popping Ice Block in a circle of fire may save your life, not being able to move out of it while suppressing the damage may cause you some issues a few seconds later. That being said, being able to become completely immune to all incoming damage and effects for a few seconds is nothing to turn your nose up at. As for the mage, Healing Touch is something they may or may not get any benefit out of. It all depends on if they decide to use it or not. In PvE, being able to heal and otherwise take some pressure off the healers is something both our raid leader and myself stress the DPS to consider. In PvP, casting Healing Touch is a very good way to keep afloat in chaotic free-for-alls or to eat a spell interrupt (since Healing Touch is the only nature school spell they’ll have, they’ll be free to cast other spells unhindered). Unfortunately, linking with a monk yields nothing for the druid right now. It’ll be interesting to see what Blizzard decides to give us in future beta builds. On the other side of the link, Monks get some fairly nice abilities from our arsenal. Brewmaster tanks enjoy Survival Instincts for a 25% reduction of incoming damage for a few seconds, adding to their already formidable array of mitigation and avoidance abilities. Windwalker Monks get to have fun with a mini-Evasion in the form of Savage Defense; something that will undoubtedly be more prevalent in PvP, but I could see PvE applications as well, mainly in the form of emergency off-tanking through Provoke and evasive spells. Our fellow healing monks gain Cyclone, perfect for CC emergencies in PvE or controlling opponents in PvP. The dispel-happy healer in me gets giddy over this one. Casting Symbiosis on a paladin gives a resto druid Cleanse, making our debuff-removal power absolute (I’m not counting bleeds as removable debuffs, since that power is limited to Monks at the moment). The ability to remove all debuffs of any type on a target is immensely useful in both PvE and PvP. While I haven’t yet had the chance to check whether or not Cleanse and Nature’s Cure share a cooldown, even having the ability to clear any debuff type on a whim is incredibly powerful. Just imagine using the combination of debuff-removal spells on a flag carrier in a battleground. That’d be a tide-changer without question. Holy paladins get Rebirth through Symbiosis, a benefit that depends largely on your raid composition and size. That being said, having another battle rez at your raid’s disposal is never a bad thing. Protection paladins get another defensive cooldown in the form of Barkskin. 10% damage reduction on a one-minute wait time doesn’t sound all that bad. Retribution paladins currently don’t get anything out of Symbiosis, but that’ll change in future builds. It’s payback time indeed, Matt. Resto druids get Leap of Faith (a.k.a. Life Grip) through linking with a priest. All griefing and tomfoolery aside, Leap of Faith will be an incredible tool to add to a mobility-minded healing druid’s toolkit. Pulling a melee out of a nasty cleave or a ranged player away from a void zone are both very pertinent situations for Leap of Faith in PvE. In PvP, ripping your teammates out of harm’s way in arenas or yanking the flag carrier closer to your side of the field in CTF battlegrounds can make a very large impact on the battle at hand. Add the Wild Charge talent into the mix with Leap of Faith and you’ll have a lot of control over the flow of a battle. While I can get behind shadow priests getting Tranquility, the spell the other two priest specs get is one that leaves me scratching my head a little. I can see a few merits to disc and holy priests being able to use Entangling Roots to stop melee attackers in their tracks, but in the fray of PvP, where damage is flying around and any CC that isn’t a stun or knockdown tends to break, I don’t see roots being used very much, and on the off chance they do get used, they won’t last very long. In PvE, I could see some use for the roots on large trash pulls with melee mobs, but that remains to be seen. Linking with a rogue gives us Evasion, something that I think will go hand-in-hand with our Heart of the Wild level 90 talent. Any healing druid in the “jack-of-all-trades” mindset that intends to be an off-tank for short periods of time will benefit greatly from linking with a rogue. Evasion for a resto druid is like a slightly better version of the Guardian-spec-only ability Savage Defense. This all goes without saying of the benefits in PvP, of course. Using Evasion against a group of melee players trying to focus you down gives you 15 seconds to breath a little and throw heals on yourself. Similarly to what I mentioned for the Windwalker monk earlier, a rogue with Growl (their Symbiosis spell) can fill the clutch off-tank role through evasion skills, such as Evasion (duh) and Cloak of Shadows, if need be. A resto druid linked with a shaman gains Spiritwalker’s Grace. While it may seem counter-intuitive for a class that relies mainly on instant-cast heals, there are benefits to being able to cast on the move. Anyone who has grabbed feathers while healing during Alysrazor in Firelands will know what I’m talking about. Being able to cast Healing Touch, Regrowth, or even Nourish while on the move can be a deal-breaker in many a situation, be it PvE or PvP. Need to move alongside the tank while he kites the boss? No worries! Flag carrier needs healing heavy healing for all the DoTs stacked on them? Problem solved! Enhancement and elemental spec shaman get Solar Beam from Symbiosis. Locking down a caster target underneath a Solar Beam can be incredibly useful, especially if they can’t move. Giving this spell to a class that already has a number of slowing and snaring tools at its disposal is icing on the cake as far as I’m concerned. Also, it gives these specs another interrupt spell as well, should a situation call for it. Flipping over to restoration shaman, Symbiosis gives them Prowl. I haven’t been able to find a shaman to test this with on the beta yet, but if it can be cast while in combat like Vanish, it’ll make a very nice wipe-prevention and/or focus-prevention ability. Linking with a warlock gives a resto druid the neat ability to remove all snares and teleport to their new warlock friend’s Demonic Circle. Of all the current Symbiosis spells healing druids get, this one is my favorite. The entire concept of the Demonic Circle for warlocks has always been appealing to me, and being able to finally play around with the mechanic makes me a very happy druid. In terms of practicality, it’s very similar to the Wild Charge talent while in humanoid form, but with a longer range and snare-breaking capability. The usefulness of giving a warlock Rejuvenation is no different than the usefulness of giving a mage Healing Touch. Like I said earlier in this post, it all depends on whether your warlock chooses to use the spell or not. Casting Symbiosis on a warrior yields Intimidating Roar. In essence, this gives us a second, slightly different version of one of our level 75 talents, Disorienting Roar, with the disorient effect being replaced by a fear. If you’re a druid that didn’t take the Disorienting Roar talent, this gives you a tool you otherwise don’t have. If you did take Disorienting Roar, this gives you a second defensive AoE spell to play around with. Either way, the spell will be immensely useful in situations where many small adds are spawning faster than the tank can round them up. Resto druids, at least currently, tend to draw a lot of threat during healing-intensive situations where many adds are spawning in quick succession (I’m looking at you, Heroic Spine of Deathwing). Having Intimidating Roar in both PvE and PvP is a great way to keep attackers off for a few seconds while you heal yourself back into good health. Granted, if your attackers are immune to fear, you may run into some issues with this spell. On the flip side of the link, warriors get some nice tools added to their kits. Arms and fury specs get Stampeding Roar, which is an amazing mobility spell for both themselves and others, no matter the situation. Protection warriors get Frenzied Regeneration, instantly convert the rage cost into health. That wraps up my post. Thanks for reading! Mindbender is the third level 45 talent. It was a giant question mark before, but it looks like it’s another pseudo-Shadowfiend. On a 4 minute cooldown, the Priest creates a Mindbender to attack the target and the Priest receives 6% mana back when Mindbender attacks. It’s only up for 15 seconds. Glyph of Dark Binding: You can now cast Binding Heal, Flash Heal, and Renew without cancelling Shadowform. Nice! I’m pretty sure that’s going to be a super, OP utility glyph. I wouldn’t call it a requirement or anything yet. But if it were up to me, I’d ensure every Shadow Priest in my guild had it on progression as a just in case measure. Glyph of Penance: Increases the mana cost of Penance by 20% but allows Penance to be cast while moving. I can accept this tradeoff. Glyph of Fade: Your Fade ability now also reduces all damage taken by 10%. Fade just became much more attractive. Spectral Guise does not appear to be our level 87 spell (Watch it in action here). You can now find it as a level 60 talent (Check WoWhead’s talent calculator). Wonder what replaced it. Edit: According to Derevka, Void Shift is now learned at level 87. Divine Insight has changed. It’s no longer just an improved Serendipity. When you heal with Binding Heal or Flash Heal, the cast time of your next Greater Heal or Prayer of Healing spell is reduced by 20% and mana cost reduced by 10%. Stacks up to 2 times. Lasts 20 sec. When your Mind Blast deals damage, there is a 40% chance your next Shadow Word: Death will treat the target as if it were below 20% health. When you cast Spirit Shell, there is a 40% chance your next Power Word: Shield will both ignore and not cause the Weakened Soul effect. Can’t wait for beta servers to come back online. I want to check out Mindbender. I’m sure it’ll be mind blowing. Have to admit, I’m a little sad panda at the loss of Serendipity. Maybe they made it a base line or something but I haven’t seen anything that indicates that yet. 4 piece: Reduces the cooldown of Penance by 4 seconds and reduces the cooldown of Circle of Healing by 4 seconds. 4 piece: Your Tidal Waves ability now grants 1 additional charge each time it is triggered. 2 piece: Reduces the mana cost of your Holy Radiance spell by 10% (Overpowered). 4 piece: Reduces the cooldown of Holy Shock by 1 second. 4 piece: Reduces the cooldown of Swiftmend by 3 seconds. Note: Last updated April 15, 2012. Healing Priests get… Entangling Roots?! Since the level cap has been raised to level 87 on the beta, Druids now have access to their level 87 spell, Symbiosis. This is one of the more popular abilities in the game because it’s one of those things where every class has a vested interest in it. I did my best to cross reference spells and abilities in the WoWHead Mists database. Certain spells that had key words like “Energy” instead of a different form of energy used naturally by the class and spec, “Druid” or included certain Druid abilities like Rip are almost guaranteed to be the Druid form. Another dead giveaway is the level when the ability is gained (it should say 87). However, Not every ability lists that. In the event of inconsistencies, I deferred to the MMO Champion list as it’s the most recently updated. * Speculation based on tooltips. Savage Defense costs 3 Chi. Chi is Monk only energy. Wrath is listed as a Symbiosis spell but is not attached to a class. I don’t even want to think about how they plan to balance this ability for arena usage. I wouldn’t be surprised if they just disable it entirely, but I’m sure they’ll give it a spirited attempt anyway. The main purpose of Symbiosis is to give classes and specs certain abilities that they otherwise wouldn’t have access to. Mages get a Heal, for example. Shadow Priests with Tranquility is pretty darn nice. Part of me wishes Holy Priests had it, but the other (sane) part of me knows that if that were to happen, Priests would instantly jump to the top. Divine Hymn/Power Word: Barrier and a Tranquility would be blatantly overpowered. Wasn’t expecting DPS Shaman to receive Solar Beam, but since they’re all with the elements and stuff, I can see why. Restoration Druids receiving Leap of Faith? I guess it’s payback time . Curious with the Balance Druids receiving Mass Dispel. Though it could be used as a more offensive ability since you don’t really see Balance Druids whipping out debuff removals as much. Feral Druids receiving Divine Shield from Paladins. Ho boy. If you notice a spell that’s in the wrong spot or if an ability’s missed, let me know but make sure you toss in a source (Screenshow, WoWhead link, or something). Let’s assume you’re a Druid in a raid group with every conceivable class and spec compositions (Let’s say science is thrown out the window and the raid limits are higher than 25). Who do you give Symbiosis to and why? How Complex Should Healing Be? In my weekly Raid Rx column on WoW Insider, I published a post with an introductory look at the Mistweaver Monk. While Monks are still in the stages of construction, there’s enough of a foundation in the beta right now that players can mess around with. Monks have two resources: Mana and Chi. One of the comments in the column piqued my interest. I get it that Paladins are monks are Blizzard’s ‘special’ healers that have to get extra resources like holy power and chi. Why can’t priests get their ‘insight’, druids their ‘harmony’ and shamans their ‘ether power’? Not a rant, just out loud wondering. Any beta testers can confirm that Monk healing is more similar to paladin than the other healer models, or not? Now Grmshepard raises a point. You can’t seem to go a day browsing the WoW forums without a few players all depressed about how homogenized and similar the different healing classes are. The four (well, five) healing classes share some similarities but one needs to look much closer to really notice the nuances. Paladins get Holy Power. At the basic level, the class lets you develop charges of Holy Power giving you the ability to amplify the potency of select spells. It’s up to you to determine what that spell is and when that timing is. Remember when all you guys did was just stand there spamming Holy Light bombs during Burning Crusade? Now you’re dropping Holy Light bombs while building Holy Power charges at the same time! … I mean, it’s something new (Sorta). Monks have Chi. It’s similar in concept to Holy Power. You’re using specific abilities to raise your level of Chi. In an earlier iteration, Monks had to utilize both light and dark chi. The general player feedback and consensus appeared to be “What’s the point?”. Therefore, that concept was simplified to just Chi. The thing with Chi though is that a number of the spells can be unloaded with just Chi. You’re using your mana to build up points of Chi. Chi can then be used to help heal your allies. The amount of Chi that is consumed has an impact on how much mana you get back (Cherry Mana Tea). It’s quite the interesting trinity. Don’t worry though, there’s still a number of healing spells that rely on your mana. What about Druids, Shaman, and Priests? My belief is that the three aforementioned classes feel complicated enough without the need for an additional secondary resource. Looking at Priests, Chakra has added enough complexity on it’s own. The player needs to decide as is which stance they need to be in order to appropriately address the challenge of the present encounter. Talents like Serendipity allow us to charge up our own stacks to unleash a really fast spell on demand. It goes without saying that Discipline is fairly flexible between Atonement style and non-Atonement style. The Priest toolbox is pretty damn large. In fact, they should just call it a tool garage instead. I’m not as qualified to talk about Druids as much. For more commentary on Resto Druids, I’d strongly suggest you head over and subscribe to my friend, Restokin. Way more knowledgeable than I, for sure. I’d say that the essence behind Druidism revolves around their HoT abilities and shapeshiftery. The latter talents in the Druid tree explicitly spell out the various benefits in switching between forms and taking advantage of the offered bonuses. Going to have to defer on Shaman as well. 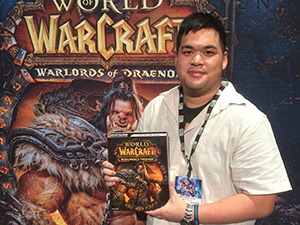 Lodur’s the guy to talk to about that and you can catch his columns on WoW Insider. There’s a heavy emphasis on totem usage and placement. Going into Mists, we’re going to see more involvement from the different elemental aspects. I need to play more Resto Shaman myself from time to time. The complexity with Shaman continues to rely upon strategic use of totems. We’ll have to see how the elemental forms play out. Do you think the healing game for your class would be better if you had an additional secondary resource of your own? How much more complex does your class really need to be? This is a guest post from WoW Comedian Wistoovern, the same mind that brought us the Automated Healing Line and WoW, What If…! So you’ve bested the agents of Deathwing, and you eagerly await your turn to destroy the citadel of fire, but what do you do in the meantime? Well, you write poetry about WoW of course! This piece came across my desk and I couldn’t help but share it with you. It reminds me of my own WoW inspired poetry for Sentry Totem, and I hope you enjoy it as much as I did. Sapping of a fellow Alliance, a night elf herbivore. “Surely this is the sign of the scoundel that killed me before. But had no jaw within his head, this beast I do deplore. Through the leather armor that he wore. Psychic Scream ’til he was blind and couldn’t take it anymore. Then purple druid would morph to bear, with dead blood flying everywhere! That this fool would think to dare the bravery of the Alliance, the boor! I tiptoed close, his doom approaching like a pit demon of yore. And soon enough, he’d be no more. Requiring the strictest compliance of form – need I say more? I cast my Fear. Too late; he knew what was next in store. He Vanished and left us by the shore. And waited for the slow receding of the debuffs that he bore. Windows of a soul berated, but his nod said little more. I took my thanks and trekked to Mulgore. Could possibly somehow be betraying his gameplay wishes dujour. And dour angry face decried that I should say no more. And thus I spoke, in quiet roar. “Perhaps in thanks, you could at least address the man that stopped that beast. Through my acts alone, his attack had ceased, otherwise you’d be done for. To show no sign of gratitude; be calm, I do implore! As if the silence somehow pleasing my freed prisoner of war. Now an owl, which to branches in a nearby tree did soar. To show the depths of prideful sinning. “Think you this is a chore? But the druid seemed to yawn as if he was suddenly bored. At that, I felt a bolt of danger from this rude and sullen stranger. “Perhaps a friend of noble Ranger, come to Eastern Kingdoms from distant days of yore? Maybe, then, you spent your summers training with the bold Windrunners? You needed help assuredly ‘gainst that recent undead sore. Traveling these lands much faster than with the dangers from broken Draenor. It still could be that from far overseas you tread upon this distant alien shore. By skills assumed and then displayed, I think my patience is repaid! From peaceful dell of quiet Moonglade you journey onward evermore. And sought to find the answer. How could my honor be restored? I knew that only by the grace of the Light could I even the score. To find the name that scours the darkness clean from darkened door. My hopes to shatter and my spirit rending its pride upon the floor. And since that day tirelessly searched for the name that I would adore. I labor long against protests, seeking the name unknown heretofore. Who knows what ancient mysteries I shall find as I explore? Perhaps I shall leave here…nevermore! – The Hows and Whys of the Battle Rez. How to deal with raiders not pulling their weight, from both a leader and non-leader perspective. Listener Topic: The State of Druids & Shaman or The Reason Why What Paragon Does Shouldn’t Matter. Don’t forget you can send us your questions or topic, and be sure to checkout and participate in the listener topic every Wednesday. Following the recent world first heroic Sinestra kill by Paragon, players have been pouring over their logs determining their raid composition and the numbers necessary to succeed in such an encounter. One thing of note is that the raid Paragon took was assembled without any shaman of any spec or flavor. This has caused a bit of a stir across the Internet as players begin to question the viability of the entire class as a whole. People are calling for buffs, for other players to be nerfed, or just randomly QQing about how under powered all of the classes are and jumping ship to roll paladins. Today I’d like to break down what the problems actually are, what fixes could be proposed and dispel some of the anger, fear and angst surrounding our class in the last couple weeks. I will preface this post by saying that this is not a shot at Paragon or any other top tier raiding guild. I appreciate all your hard work and your accomplishments. This post is for the rest of us out there, who aren’t quite at their level. The DPS of the shaman class has always been a wobbly wooden seat in a room full of steelchairs. Ever since the days of Vanilla WoW, our Viability as DPS has sort of teetered. I’m not going to pontificate on it too much, as I’m really a healer, but I started my WoW career throwing lightning on my magnificent Tauren Shaman and still do it now for fun and a change of pace. In BC and much of Wrath I took it away from elemental and smacked things with sharp objects and big sticks for entertainment, so suffice to say I’ve spent at least some time DPSing (yes this includes raids and hard mode raids when it was necessary). Right now the big argument is that scaling is the issue. I can see why, and maybe there is a valid concern here. Right now at “Blue level gear” a shaman is capable of toping charts and blowing away everything that stands in front of them. The logical assumption is that scaling is the issue, that we don’t’ scale well compared to other classes as higher gear becomes available. Maybe part of that is true, but managing spellpower coefficients is a tricky science and one that Blizzard is already looking at. If you tweak it too high you can break the system, tweak it too low and the class becomes useless. When you see them say they are increasing a spell’s power by 10%, they really mean they are adjusting the coefficient. We’ll get into that a little more later on here in the post, but just keep that in the back of your mind for now. Personally I feel that scaling is the lesser of the issues for damage. I contend that movement has always been the greater bane of the shaman in all aspects of life. We’re turrets, we’ve always been turrets, and anything we get to help us do our job on the move is only a stop-gap to tide us over until we can sit still and go back to work. I’ve done fights where I’ve out DPSd an equal-gear equal-skill hunter because I was able to sit in one place and just cast Lightning Bolt after Lightning Bolt (metaphorically speaking, I did use other spells), but on a very movement heavy fight I was crushed by an under-geared affliction lock. Literally the only difference was movement. While I agree that some of the spells need a little tweaking to make them a little less RNG dependent and help with minor scaling issues, I would have loved to have seen something that elemental and enhancement shaman could have grabbed to either extend the period of use for Spiritwalker’s Grace or shorten its cooldown. I think that overall would be a better, more utilitarian fix. Either a talent stuck somewhere or attached to something else. I could easily see it being an additional effect of Ancestral Swiftness. Now this is just an idea, and maybe it’s not the best one, but I think it goes a little further to solving the real problem. This goes for both elemental and enhancement. While our mobility has improved, at any point in time we have to move, it takes us the longest to recover and start back in to try and maintain our offense. I throw magic water on it, BE HEALED! Lets get into the topic that is a little bit hotter of a debate, and more in my area of expertise. Right now the debate is that shaman healing is way too low when compared to other healers. While our numbers are seemingly low when compared to priests and paladins, our numbers seem to line up pretty closely to restoration druids. I think this happens for a few reasons. Shaman are the healing model for Cataclysm, or so we’ve been told since day one of the healing change discussions. I still feel this to be very true. I’ve not encountered a fight I haven’t been able to heal through with hard work, determination and communication with my group. Sure some fights are harder on us than others, but that boils down to a few reasons. First of all shaman have slightly different mechanics than, say, a discipline priest. We don’t really mitigate damage, we stabilize and then bring everything back to whole. Healing Rains, Healing Stream Totem, Riptide, Earthliving and even Earth Shield all lend themselves to helping us stabilize players so we can either edge their health up with Healing Wave, drop a nuke like Healing Surge and Greater Healing Wave or use Chain Heal to quickly bring a group from the brink. Our job isn’t to keep everyone topped off anymore, it’s to keep them stable and alive. The difference in healing tactics is something we should be used to by now. In Vanilla you basically spot healed when you needed to while making sure your totems were optimally placed. In Burning Crusade you down-ranked Chain Heal and just spammed it regardless of content size and things were good as we stacked haste and MP5. In Wrath things got a little more complicated. With down-ranking of spells rendered ineffective, and the addition of a new spell, Riptide, we basically had to relearn how to heal right. We did hit a patch of trouble at the Ulduar phase of the expansion where players discovered Riptide and Lesser Healing Wave did so much healing that our other spells could be all but forgotten. This was balanced out by Blizzard at the time, but it still meant that through the life of Wrath we constantly adjusted our healing style and strategies right up until ICC dropped. Before our job was always to restore everyone to full, or as someone aptly put it on twitter, to “HEAL ALL THE THINGS!”. A lot of shaman are having trouble making the adjustment, especially those that are rolling one for the first time after playing a paladin, priest or druid. So part of our problem is there is a rather steep learning curve right now. Secondly, just like our DPS brethren, movement is always an issue. Anytime we are forced to move our HPS drops like a rock. While we have tools to help us out in that regard, we still lack things like a multiple person HoT that we can control where it goes and can cast at the rate of a GCD between them. Once we get into position it can sometimes take us a few moments to play “catch up” with healing. The same fix for DPS could in theory be applied here. Give us something to extend SwG out or reduce the cooldown and that will go a long way to helping through put. Although at that point, since all three specs would benefit from it, it would basically be a redesign of the spell. Point is though, movement fights (which Cataclysm has many of) are doable, but we still suffer for it. Lastly, some of our spellpower coefficients feel off. Not massively so, but just enough to notice it. Particularlly with Chain Heal, Greater Healing Wave and Earthliving. Right now on the PTR 4.0.6 build, Chain Heal is getting a 10% buff. While most would assume this means that it will heal for 10% more, this isn’t exactly the case. Remember what we talked about before with spellpower coefficients? Here’s how the buffing really works. Right now on live, Chain Heal has a spellpower coefficient of 0.32 or 32%. This means that 32% of your spellpower directly affects the amount you heal for when using that spell. On the PTR this has been increased to 0.35 or 35%. Now you may say that this is a 3% increase not a 10% increase, but look again. What got the 10% buff was the coefficient as 10% of 32 is roughly 3. This is a lot better than it seems really. As the game progresses, we will mass more and more int, and as a result our spellpower will grow. That 35% coefficient will go further to scale us better with gear as we get “older” in the content. Same goes for Greater Healing Wave which has an estimated spellpower coefficient of 80%. It is getting a 20% bump, but that means on the PTR it has a coefficient of almost 96% if my math is right. Again, see where this is going? Sadly, though, Earthliving is not getting any attention yet, and I think it really should. For something we can’t control where it goes and who it heals, it feels weak. When it does proc you don’t control who gets the healing effect, and a lot of healing can be wasted this way on targets that you bring to full health only to watch the HoT keep ticking away. It is something I think could stand to be tweaked just a little bit. Haste certainly gives it a little boost by allowing it an extra tick of healing, but it is still spread out over 12 seconds. I can’t help but feel raising it to a 25% sp-coefficient from 23% would go a long way to help alleviate some of concern with it, and make it count on those it lands on that need the healing. It’s not a perfect solution, but I could see it being beneficial. But why the hell are paladins and priests pulling so far ahead? Short answer, they’re a little bit broken right now. True priests are complaining about mana issues, but Prayer of Healing is really strong right now, currently stronger than Chain Heal by a sufficient margin. It is also spammable to a degree, while we are forced to move away from Chain Heal spam. Little things like this are what allow priests to pull ahead by such a large margin. Paladins are just, well, in a word ridiculous. The amount of free healing a paladin gets is honestly quite staggering. While I’m certainly not saying that paladin healers aren’t talented, it’s worth it to note that our big heal at a raid ready gear level will be somewhere between 23 – 32k on a crit. Paladins? Well for that same GCD that paladin with equal gear will hit the same amount. Then you get the free heal from beacon of light which will then heal for 50% of whatever the primary target was healed for. That’s a huge chunk of healing right there. Combine that with the free healing a paladin gets to do with Light of Dawn and you can start to see some of the disparity. So right now things aren’t very balanced. That’s OK. We’re not paladins or priests. We’ll never be paladins or priests, and that’s OK too. The new patch being tested on the PTR right now will be the first step to balancing out healing. Our heals are getting stronger, and paladins and priests are getting fine tuned. This should bring all four classes back in line with one another, leaving shaman for the most part untouched except for some much needed tweaks in the positive direction. But Paragon didn’t use ANY shaman! Method only used ONE!!! That means I won’t have a raid spot! You realize not everyone is Paragon or Method right? These are top-tier guilds that push through content as fast as possible using every little advantage they can to get the kill and be number 1. Let’s take a trip in our time machine back to the release of Black Temple. Nihilum got the first Illidan kill, and do you know how they were geared? They didn’t farm BT for weeks gaining gear to increase power levels. No, they charged through the content and pushed right up to him as fast as possible to down him. Most of their raiders were in the previous tier’s gear or lower. They pushed through the hardest content with a lot less gear than a normal guild doing the fight would have had. Fast forward to Cataclysm and the trend continues. If you want to be bleeding edge, right there at the forefront of the digital war for number 1, you don’t stop to farm gear. You grab what you get along the way, and keep pushing. Class imbalances play a huge roll in this. If you have four healing classes, and two of them are pushing 30% more healing than the other two, you’re going to stack them. Why? Because that extra advantage compensates for lack of gear, and helps you push through the content. The same goes for DPS and tanks. I can’t remember which guild or which fight it was, but recently a group stacked a ton of druid bears to push through the fight. Does that mean every guild should stack nothing but druids? No, not really. Truth is that for the average guild (and I mean literally if you would take all the guilds in the world and plot where everyone falls in composition and progression), you won’t have to worry about this. As you defeat bosses and gather gear every week, you’ll do nothing but improve. Keep in mind too that this was a heroic raid boss that was completely untested before anyone actually engaged her. By the time you manage to get there, you’ll likely have geared up quite a bit, and chances are good there will be at least one or two hot fixes in that affect you or the other healers, maybe even the encounters. Any good raid leader worth their salt will know that guilds like Paragon are the exception, not the rule. If you’re in a guild that the raid leader is pushing to have the same composition, well, maybe it isn’t the best place for you. Really, the moral of the story here is that you shouldn’t let what one guild does on one fight dictate how you play or how you compose your raids. Classes and abilities will sometimes be imbalanced, trust in the developers to notice and balance it out in the end, after-all that is what they get paid to do. Expect and prepare for change. Remember Ulduar? In wrath, shaman at the tier 8 content level were falling behind in AoE healing by a considerable margin. Players were forced to stand apart further than chain heal could jump, and we were forced to rely on alternate healing methods. This was brought to the developer’s attention, and chain heal was buffed to cover longer distances between players. During the time of this crisis, we heard much of the same concerns as we are hearing now about healing. Hang in there, don’t get discouraged, it really isn’t that bad. The things that are bad? Well those are being looked at right now. Update on the Druid/Shaman healing situation in progression raiding. The listener topic this week tackles difficulties you face as a raider. Each week on Matticast we will be featuring a topic driven by our audience. You can submit your comments on this post, or e-mail us with your thoughts. You can even send us an audio clip (mp3 format please). This is your chance to have your say on what we discuss on World of Matticus. Also don’t forget, if you have general questions you’d like answered on the show, you can send them our way! This week we are looking for your opinion on class balance amongst healers in Cataclysm. A debate was sparked by Paragon’s Xaar on the EU forums over how useful Druid and Shamans are in high end raiding. What are your thoughts? Are you avoiding taking Druids and Shamans on your raids? Are Paladins and Priests that much better? What healer makeup does your guild prefer to take?